IC: You find yourself in on a dock with a hitch, the hitch being that this dock in up in the air, on the highest level of the Transcontinental Island. Of course, this island is currently in the Caribbean and has the ability to move at the owner's whim - which may be at any moment. Fes sat at the edge of the dock, chewing her gum and trying her very best to be patient. It was not an easy thing to do given her disposition, but she managed, of course her management mostly consisted of swinging her legs and whistling some unnameable tune. Jel strolled dock with a hint of enjoyment in his stride. The last time he had seen the Transcontinental Island, it had been drifting through the strait of Gibraltar... not his favorite place by any means. Needless to say, this was his first time ever making the visit, and it was only as a refuel stop as far as he cared. He saw the girl sitting on the edge of the dock, and couldn't help but stop. "Enjoying the view?" he shouted over the wind and her whistling. He had, of course, no idea if the conversation would lead anywhere, he just felt abnormally opportunistic, if not a little bored. "I've been wondering when you'd show up," she mused. Making to stand up, she analyzed JelDhen. "Are we going to start this, or what?" She was fully standing now, dusting off her striped tight pants and clapping the dirt off her hands. Several thoughts flew through his head as he tried to decipher this woman's rather presumptive words. Was she confusing him for someone else? Was she making some kind of advance on him? His eyebrow shot up in confusion, and he quickly reminded himself of that completely obvious pepperbox he carried at his side, just in the case of crazies like this. "I'm sorry, but I'm not sure that I..."
She cut him off by thrusting a flexi in his face. "You were supposed to be here twenty minutes ago. Didn't you get the class schedual when you came in?" Jel's eyes widened, "No, no, no, no... Classes start tomorrow. I got here a day prior..." His confidence fell, "right?" He let out a sigh, "well that might explain the small fleet of trainer dirigibles up in the sky today." 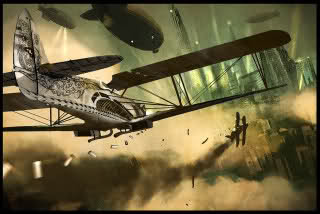 The airships littered the sky like kites on a windy beach.. he had chalked it up to a contest of some sort. Now he just felt embarasses. He scrolled down the flexi's information, finding his schedule. "Ah.. Miss Corriday?" "Fes," she corrected, twitching slightly. "J-just Fes. That's it. Just Fes. And if you say otherwise I just might be inclined to disembowel you with a dull spoon." Taking a deep breath, she composed himself. "But no, yes. Class started twenty minutes ago. Be glad that I have a free flowing curriculum." JelDhen looked over the curriculum. "Wait, so where are my classmates? I know class sizes stay small here, and that's fantastically radical... but this class is one-on-one?" He sighed, and rummaged through his pack for his small textbook, "Problem-Solving, right? Forgive me I can't even figure out what to call this class. Intro to Airshipmanship?" Fes rolled her eyes, snatched the book from JelDhen's hand and tossed it off the ledge before he had the chance to react. "Yes, one on one class. No textbooks. You are being evaluated for further... stuff. Not really sure what. They didn't tell me. But the fact of the matter is, you're failing miserably at the whole 'problem solving' bit." "You want me to solve a problem? Considering that my problem of the moment happens to be a woman, about your height, who has an obnoxious proclivity for telling me everything as if I should have known it far before ever meeting her, I suppose that I have but one solution." He stood, pocketing the flexi, and posing into a half-hearted 'attention' stance. "Cadet, JelDhen Whitefall, reporting for instruction and evaluation." A do-over, a mulligan, whatever you might call it, seemed very much in order here. Fes glared at him. "Fine. Whatever. Relax. Follow me." With that she stormed off, rounded a corner and disappeared. Jel scrambled together his belongings and chased after her. "Miss Cor---Fes. Fes!" It was useless. All he could do was just follow her until she would come to a stop. He muttered as he ran, "First day at the Academy and you're already chasing a girl, way to go Jel." But to no avail. Fes has completely vanished. Jel'Dhen sighed, and took in his surroundings. He took a look at his class schedule. Try the easiest thing first... does she have an office? A prefered tutor hall? A ship? Obviously the answer lay before him somewhere, even if he must ask someone nearby for help.. though it would not be his first choice. Luckily, someone happens to be nearby. Josh had been sitting at a table on the edge of the dock, drinking his tea and pretending to read a book. He'd seen the whole thing, and had, in fact, fully expected it. He'd been prepared for it. Let the games begin, he thought. jel walked up to the man at the table, and semi-politely tapped his fingertips on the desk to get the man's attention. He did his best to maintain the appearance of being in a hurry. "Hi... Did you see Fes walk through here? I'm her student today and I haven't the foggiest where she ran to." OOC: Is JelDhen suddenly British? Or did he just pick up lingo from Krys? lol because it'd be pretty funny to hear him say that in a Canadian accent. IC: Josh looked up, trying to keep his face straight, the result being that he looked bored, which he supposed would do. That face didn't last long, however, because eventually Josh cracked a smile and nearly burst out laughing. "You really think Fes is your teacher?" "Honestly," he started as he looked around shiftily, "up until that persuasive girl started shoving flexies in my face, I was completely convinced that classes started tomorrow.. Do you know where I can get a fraction of real orienteering?" JelDhen smiled, "Study-at-home courses, and some work experience cred. Other than that I'm a freshman... with about a year of school under my belt." He extended his hand to the man, "JelDhen Whitefall. And whom would you be?"